"Videos, music, how to". Above is a direct link to my page with lesson videos. Online videos, text, tutorials, practice, and more from the publisher of the text we use for Algebra and Geometry at Gunnison High School. An excellent place to begin for a brief review of any concept we cover! Awesome site from the Henrico County School District in Virginia. 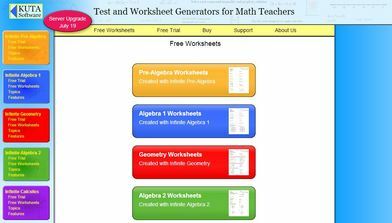 Similar to the Algebra site with more interactive applets. Excellent resource. Free worksheets with answers for a variety of topics we will cover throughout high school. Excellent way to get some extra reps! Colorful video lectures from an entertaining math teacher. Click on videos and choose your topic. There are worksheets you can print off as well to follow along with the lecture.